Let's start at the beginning. I am an elementary school art teacher. While teaching in Houston I was lucky enough to meet and get to watch George Rodrigue paint his famous Blue Dog. Fast forward to today I'm back in my hometown of Sand Springs, OK which was founded by oilman Charles Page. His legacy of "Thinking Right" lives on in charities he began that are still in operation. I currently teach elementary art and I am the only elementary art teacher in the district. 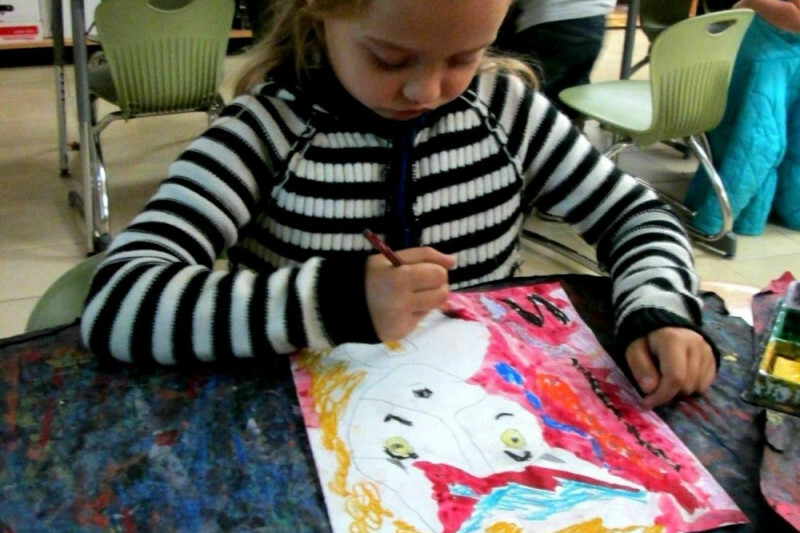 Our school infuses art into all areas of the curriculumn. My students love Blue Dog! Using Blue Dog we have been able to cover many subjects like music, math, history and science in our art classes. In addition, I am also a volunteer and the Education Chair on the Sand Springs Cultural and Historical Museum Board. I think you can see where these two interests have collided! Through my connection to A+ Schools and their connection to the George Rodrigue Foundation we have sequred art for a George Rodrigue Art Exhibt, The Rodrigue Family and Foundation have generously donated the art to be used during the 3 month exhibit in November of 2018. That sounds wonderful and it is; but, then you figure in the other costs not covered and here we are. Your generous donations will pay for the shipping and insurance while in route from the George Rodrigue Foundation to our museum and back after the exhibit. Additionally, it will pay for security in the form of sound alarm hanging hooks and actual security guards. Things our small museum doesn't regulary have or need. An insurance waiver will be added to the museum's regular insurance policy to cover the exhibit art and finally, portable display walls need to be built. We need to have the money secured by August 1 of 2018 in regards to the insurance, shipping, insurance waiver and security. In regard to the display walls, the funds for that need to be in sooner so the matericals can be purchased and museum volunteers can build them. The exhibit will benefit the city of Sand Springs; potentially reaching thousands. We have numerous elementary schools and only one has actual art classes. In addition, even though we are located close to two major museums, often parents have no way to take their children and this leaves a large population underserved in the arts. Being near a large metropolitan center and with so many others just an hour or two away it is likely that this will be a regional exhibit drawing people from Tulsa, Oklahoma City, Kansas, Arkansas and Texas. The art of George Rodrigue is fun and lively and draws the crowd in. What a great way to expose so many people who may have never been to an art museum to fine art. Sand Springs is a town with a wonderful philanthropic beginning and now you have a chance to join us in one of our adventures. Your donations will help us share world class art in an fun and accessable way. I can see the children looking up at these bright and bold Blue Dogs. The late artist’s wife, Wendy Rodrigue, and George’s son, Jacques Rodrigue, will be there to share stories of George. Parents and grandparents will see the world of art through the wonder of the young and businesses in and around Sand Springs will benefit from the influx of visitors to the area. We will be so very grateful if you can in any way help us to fund this splendid art event. Please join us in this endeavor! Join us today at Art in the Park which will be held in Sand Springs on the Triangle in downtown at Main & Broadway for a student art show complete food trucks, live music and lots of pet friendly things to do. Micro Chipping & pet tags by the OK Alliance for Animals, beautiful pottery dog dishes by Pottery by Jezz, and a fun dog costume contest. Sandra Kent, the Executive Director of Oklahoma A+ Schools was one of my classmates in the 10th group of the Oklahoma Arts Councils Leadership Class this past year. As we chatted during the sessions I shared my student's enjoyment at learning through the arts and we talked about one of their favorites-George Rodrigue's Blue Dog. Through her connection with Louisiana A+ Schools and the Rodrigue Family we have come to a wonderful place. The Rodrigue Family & the George Rodrigue Education Foundation have generously donated the art for a 3 month exhibit in Sand Springs...the first time George Rodrigue's work will be shown in Oklahoma. To make it a reality, though, there are some logistical costs such as transportation of the artwork to and from our museum, insurance, security and such. Please keep this dream alive for the students of our community. Donate today and please share this. Thank you!!! !